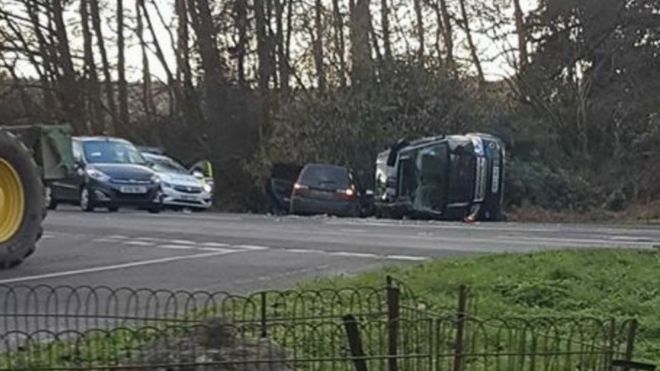 Prince Philip, 97, was not injured in the accident, which happened as he drove a Range Rover out of a driveway onto the A149 shortly before 15:00 GMT. The Duke of Edinburgh has been involved in a car crash while driving near the Queen’s Sandringham estate, Buckingham Palace has said. Buckingham Palace said the crash involved another car, and two people in it were treated for minor injuries. Eyewitnesses said the car that the duke was in overturned. They said they helped the duke out of the vehicle. He was conscious but very, very shocked and shaken, they added. The duke is back at Sandringham and has seen a doctor as a precaution. Another eyewitness who drove past the crash scene – near a village called Babingley – at around 15:40 said she saw an ambulance and “a heavy police presence”. “I was just going down the A149 … and saw a lot of blue flashing lights ahead,” she said. “I saw a black, 4×4 type car on its side and me and my son were like ‘oh my word, that doesn’t look good’. “Luckily it was just sort of on the side of the road, the road wasn’t closed in any way. Nick Cobb, a long-time Babingley resident, was driving past with his 16-year-old daughter Emily at about 15:10 GMT when they spotted an overturned car about 100 yards from their house. “The Range Rover was on its side on a private road. “The other car was well into the hedge on the opposite side of the road. “There was lots of debris in the road, lots of glass and lots of other cars, some police cars, some from the Sandringham Estate and about six ordinary looking cars that looked as though they had stopped to help. The BBC’s Nic Rigby, at the scene, says all that’s left are pieces of broken glass and the remnants of a wing mirror. It has been a chilly day, he adds, and there were small flurries of snow in parts of Norfolk, but nothing that troubled the county roads. 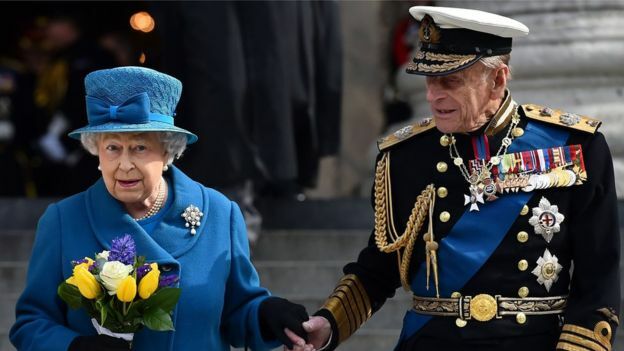 The Queen and Prince Philip have been staying at the estate in Norfolk since Christmas. 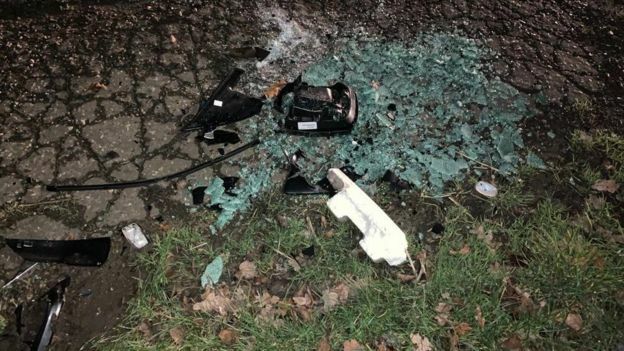 The Archbishop of York, John Sentamu,tweeted a prayerin support to the duke, and later another one for the two other people involved in the accident.